Hi stampers! Wow, it has been a whole WEEK since I have posted! (ridiculous!!) I did NOT mean for that to happen...life has been incredibly busy lately. I even had a post ready to share with some of the beautiful birthday cards I received this week. (stay tuned...it's still coming...) I just need a few more hours in the day...Ack!! These colors are so rich! I tried to do them justice...although what I lack in CAS-skills, I completely make up for in sparkly accents...hopefully! :) The tree and the sentiment are heat embossed and I dressed up the background by adding some texture . I hadn't used the Snow Swirled set in a while, so I thought it was about time to break it out of the case. All and all, it was an easy card to create, which is totally my cup of tea, lately! Please stop by the 'Paper Players and check out what the rest of the DT have created for inspiration this week. We sure hope you will join us and play along! Hope you had a fantastic weekend! Hugs/! Very pretty, AM! Can you believe that I don't have that set?! I love the embossed silver paper; that looks pretty awesome! Ann Marie this color challenge is GORGEOUS. I am so enjoying the reveals and love what I'm seeing by the DT. Gorgeous everyone! Love it. Hugs. This is just gorgeous! Embossing the silver paper has such a wow factor! Love it! Beautiful....and love the Snow Swirled tree. Love it all! That gorgeous stamp, the fabulous embossed background and that scrummy ribbon! Beautiful, Anne Marie! I love this layout! The bling is the perfect touch! Sigh! Both these Christmas Cards are beautiful! And I really like those sketches. I too find myself short on DSP card stock and ribbon! Always something we need! Gorgeous! I almost did a tree too-great minds think alike-but changed it at the last minute! That ribbon treatment is spectacular! Stunning Anne Marie. I love all your texture and the navy ribbon, just beautiful. What a beauty! How do you get those ribbons so stunning? That is so well done Anne. Love it! Your card is super duper beautiful. Never thought of using blue in a Christmas card, but what a great idea. Love it! AM you absolutely did justice to the challenge. 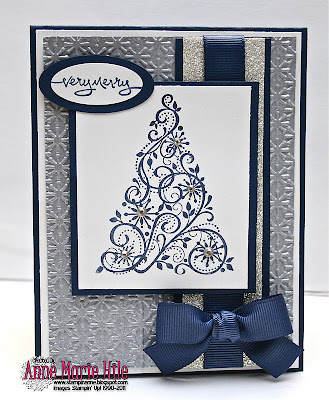 I need to use the snow burst embossing folder with the metallic paper, its a fabulous partnership! Love your bling on the snow swirled tree, too. Gorgeous card. You use this set beautifully EVERY time...why don't I have it yet?! 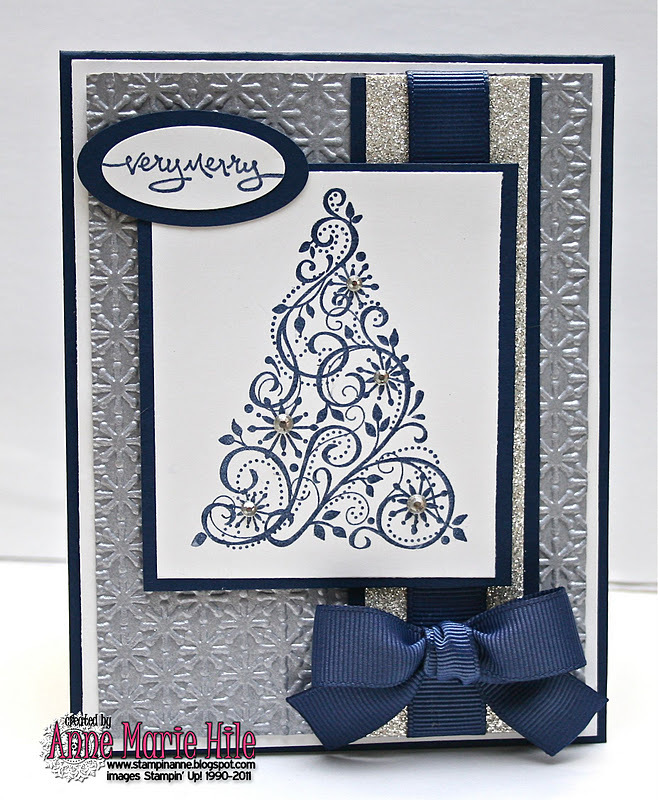 Gorgeous card AM...the embossed silver background is so cool and elegant and your bow is fabulous! Beautiful job! This is stunning! 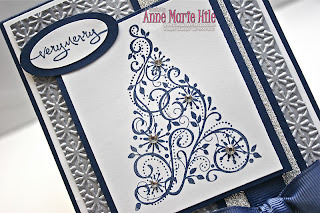 I love the embossed silver paper and the tree is just gorgeous with these colors! This is so really pretty, love the colors and how the image is so crisp. I think you did a great job. Have a wonderful holiday and give all the fur babies some hugs from us. This card is gorgeous!! I love the embossed silver sheet. The color combination is fantastic!! What fun!! Great job my lady!! Amy L.
This is gorgeous, Anne Marie ! 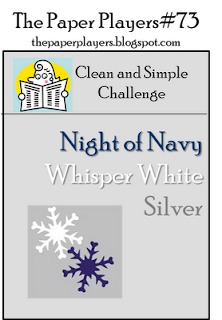 I like the silver embossed background and the big bow looks super great. Ann Marie Just wanted to stop by and say I hope you have a Happy Thanksgiving. Thank YOU for all the inspiration you've given me. Hugs. You know how much I adore CAS and this card just nailed it!! cAS, elegant,classy... the whole package. Stunning!!! Anne Marie, This is so lovely. I am digging the embossed brushed silver paper. I have played with this but not been able to pull it off like you. Your bow is just so luscious and finishes this fabulous card perfectly. Love the bow Anne Marie, your card is gorgeous!